This week’s Diva Challenge (#328) is a Use My Tangle (UMT) by Suzanne Fluhr (CZT and Guest Diva Blogger) for her tangle, Aloha. Suzanne writes a travel blog I really enjoy reading called Boomeresque. Mike and I had the honor of meeting her, and the infamous Mr. Excitement, when they were in San Diego for a cruise earlier this year. We had dinner and did some walking…topping it off with ice cream. What could be more fun? It is fun and bold and graphic. It makes a great border, string, or if you make it big enough, you can even tangle inside it. So I wanted to do it a little bigger, and on one of my alcohol ink mono prints that reminded me of Hawaii. It is, after all, called Aloha! So…you may notice the other tangle I used here. Yes, it is new. AND…it is my VERY FIRST tangle. 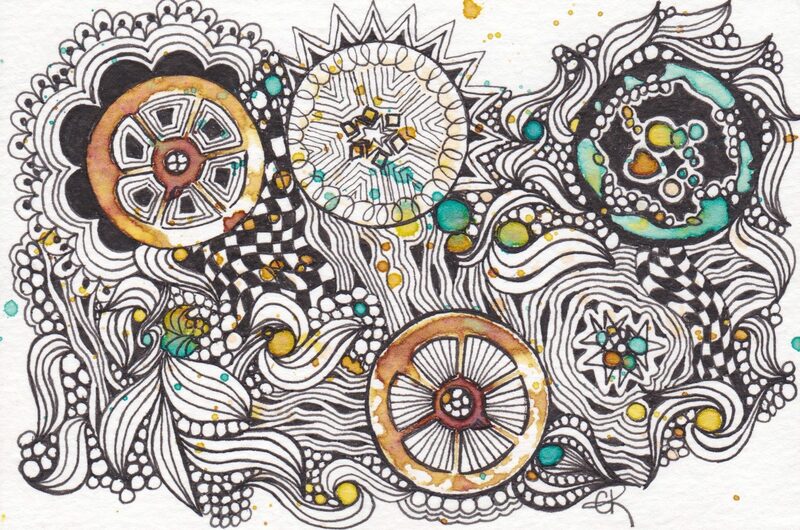 I call it Abukas, and it is influenced by Lynn Mead’s tangle Abeko and the original Zentangle® tangle Arukas. I rather stumbled on to it while I was working on some smaller Bijou tiles for a project I am working on. I thought to myself….self….you should do a step out for this and see how it comes out. So, here it is for all you to try, too! I like how art deco it looks, and I think it has a lot of potential. I have had some grand fun playing around with it, and I know a few others have tried it as well. Speaking of those little Bijou tiles…here are some more of them. I love doing these little things. It really helps me stretch my creative juices without a lot of sit down time. While I love to tackle larger projects, I think it makes it more fun to break it up into chunks, like we can do with an Opus tile. I tend to lose my motivation when faced with finishing one of the really big things, like this mandala. It actually sat on my easel for just over a year! Finally took some Inktense Pencils to it, blacked in a bunch for consistency, and attacked it with a gold pen. Yes, that is a pen. I am prepping some wool appliqué to keep me busy during a couple of flights next week, so I had best get back to it. Have a Wonderful Week! Aloha! Love the Aloha-Abukas combo. As you might have seen on my blog, I think Aloha compliments tangles in the round. I’m in an organic tangles phase, so Abukas is definitely being added to my repertoire. PS: I have fond memories of our meet up in San Diego. Next time I want to make it up to Temecula to sit and tangle in your studio, take a class and try out your products. I wish it were closer. I look forward to our next get together, whether it is here or wherever! I love abukas and will be giving it a go! Thanks for sharing it! Wow, I like them all, but the big Aloha one is my favorite. Thanks for sharing Abukas! I love stacking things Arukus style. Nice tangelation! Your Aloha is quite nice as well, and I love your pretty gem. Love your combination of Aloha and Abukas! That gem is quite the piece. Was it melting? Like the combination of Aloha and Abukas. They compliment each other well. I still have not set up an Evernote account, contrary to my sister’s urging. I need to do something as it is easy for me to forge about tangles that I want to use more. There are so many now. The Gem is turquoise and it is often irregular shapes when single. Thank you! Beautiful work, all of it! I love Abacus and would love to follow your blog. How do I do that?? There is a bar button in the top right of the page that says Follow. It is blue if that helps. Charlotte! Another HUGE collection of gorgeous pieces of art! I am so excited about your tangle… it’s AH-MAZING! That mandala was definitely work on a large scale… breathtaking! Your diva challenge piece is spectacular! Thanks for sharing; I like the art deco look, too!